If you like fishing with a guide who is impatient, doesn’t really know the lay of the land, has a narrow range of skills, and is disorganized and ill-equipped, then don’t go fishing with Eric. He’s the opposite. Eric takes equal pleasure in putting an accomplished fly fisher on a promising stretch of water with the right fly at the right time, or teaching a raw beginner how to get that first cast on the water with minimal pain and frustration. 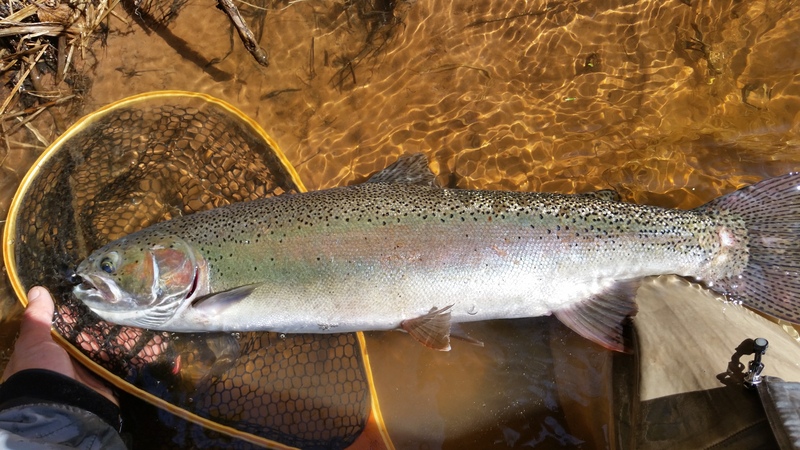 He knows fly fishing from a lifetime of exploring streams across the country, and is dialed in to the MN/WI scene whether your quarry is a 6-inch wild brookie in a local spring creek or a 28-inch Brule River steelhead. Fish with this guy. You’ll learn plenty and have a great time doing it. My experience was a really good one. I had gone in with no experience at all. The guidance provided from how to cast to where to cast was top notch with a wealth of knowledge demonstrated. I was shown exactly which fly to use based on where we were and time of year. I even was shown where to see the real life examples to compare the flies to. There also was shown a clear knowledge of where the fish were with good size ones being caught. We found a spot where it seemed as soon as the line was put in there was a bite. I loved both the natural beauty of the experience, and learning so much about the beauty of fly fishing that comes from gaining an understanding of the rhythms of the fish by the immersion in that depth of knowledge the guidance provided.